To Cite: Kheirkhah F, Poorkarim K, Hosseini S R, Bijani A, Parsian H, et al. The Association Between Zinc and Cognitive Impairment in Elderly People of Iran, Shiraz E-Med J. 2017 ; 18(7):e13093. doi: 10.5812/semj.13093. Background: The association between serum zinc levels and cognitive impairment is a controversial issue. Objectives: The association between serum zinc levels and cognitive impairment was investigated in the elderly population of Amirkola city, northern Iran. Methods: The data of this cross-sectional study came from a large cohort study, known as the Amirkola health and ageing project (AHAP). The sample included 1004 eligible participants aged 60 years or older (486 females and 518 males). The staff of healthcare centers interviewed the participants and completed the Persian version of the Mini Mental State Examination (MMSE). Their serum zinc levels were measured using the ZishChem diagnostic kit. Results: Of all of the participants, 347 (33.3%) had cognitive impairment. Furthermore, 254 participants (25.2%) were classified as having mild cognitive impairment, 82 (8.2%) moderate, and 11 (1.1%) severe. A total of 160 females (32.9%) and 180 males (34.7%) were within the normal range of serum zinc (80 to 120 μg/dL), 133 females (27.4%) and 121 males (23,4%) were within the high range of serum zinc (> 120 μg/dL), and 193 males (39.7%) and 217 males (41.9%) were at low range of serum zinc (< 80 μg/dL). There was no difference between the 2 groups of the elderly population (normal MMSE and abnormal MMSE) with respect to the level of serum zinc. 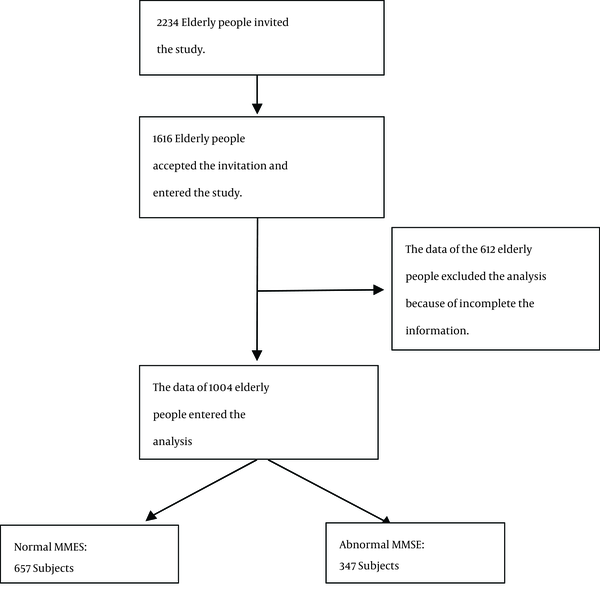 Conclusions: The results do not support the belief that serum zinc levels may be associated with cognitive function in the elderly population. Cognitive impairment is an important part of the diagnostic criteria for neurodegenerative disorders (NCDs), and it is also is a risk factor for NCDs (1). Furthermore, NCDs are a common illness in the elderly, and they represent one of the most important factors in disability and mortality (2). The prevalence of NCDs is estimated to range from 2% to 8% in the elderly population (3). Studies on NCDs have shown that many factors are associated with this disorder. These factors include a history of cardiovascular disease or hypertension, depression, and osteoporosis (4-6). Epidemiological studies have found that nutritional factors are linked with NCDs (7). Studies support that vitamin E and selegiline could slow or stop Mild Cognitive Impairment (MCI) to moderate/severe NCD conversion (8, 9). Zinc is an element that has widespread function within neurons, including binding to metal-binding proteins, and the modulation of presynaptic, synaptic, and postsynaptic neurotransmitter receptors, such as N-methyl-d-aspartate and Gamma-aminobutyric acid (10-12). Therefore, the homeostasis of zinc has a critical role in the maintenance of normal cellular processing. Intracellular zinc has an important role in the pathophysiology of neurodegenerative disorders because it is a major contributor of oxidative stress in brain aging and cell death. Numerous studies have indicated that an increase of intracellular zinc is linked with oxidative stress and age-related neurodegeneration (13, 14). Also, the effectiveness of supplements like zinc (Clioquinol) in abrogating some of the pathological consequences of NCDs in a clinical trial indicates the pivotal role of metals in the progression of NCDs (15). However, a number of studies have found that zinc therapy has no effect on cognitive impairment in the elderly population (16-18). Moreover, the association between serum zinc and cognitive impairment is a controversial issue. Although extensive literature investigated the role of metals in NCDs (7-9, 13, 14), a few studies focused on the relationship between zinc and NCDs (15, 19). To date, no information is available about serum zinc levels in the Iranian elderly population and its relationship with NCDs. The primary purpose of the present study was to assess the relationship between zinc and cognitive impairment in a large sample size of Iranian elderly. The secondary purpose was to evaluate the relationship between cognitive status and the level of serum zinc. This cross-sectional study was carried out at the social determinants of health research center of Babol University of Medical Sciences of Amirkola city (north of Iran). It is part of a large cohort study known as the “Amirkola Health and Ageing Project” (AHAP) (20). The Medical ethics committee of Babol University of Medical Sciences approved the project. Informed consent was obtained from all of the participants or their relatives. A three-stage process was used to conduct the study. When this study began, Amirkola had an elderly population of 2234 (1158 males and 1076 females). First, healthcare center staff invited the elderly to enter the project through posters distributed throughout the city. The staffs of the healthcare centers visited the participants in their homes and completed the demographic questionnaire. On the next day, the elderly came to the SDHRC of Babol University of the Medical Sciences in Amirkola and completed the other questionnaires. The staff used standardized forms to collect demographic information, medical and familial data, with the help of patients’family members. The study had a total of 1616 elderly participants. In this study, 612 people were excluded because of incomplete information. Therefore, the data of 1004 participants was included in the analysis (Figure 1). In the second stage, all of the participants took part in cognitive function test assessments performed by 2 trained healthcare practitioners. The practitioners interviewed the people to complete the Persian version of the mini mental state examination (MMSE). The healthcare practitioners participated in a workshop to train them regarding the use of the Persian version of the MMSE. The MMSE is a brief screening test for cognitive impairment, which has been widely used for the elderly. The MMSE includes questions that test the skills of attention, memory, orientation, language, and visual-spatial ability. The total scores range from 0 to 30. The most widely accepted indicator of the presence of cognitive impairment was a score of ≤ 24. A cut-off score of 24 by age and educational level was selected using the score adjustment coefficients proposed by Magni et al. (21). In this study, 4 levels of cognition status were described, including normal (25 to 30), mild cognitive impairment (20 to 24), moderate cognitive impairment (10 to 19), and sever cognitive impairment (≤ 9) (22). The MMSE questionnaire is very dependent on the level of education, and a large number of the study population was illiterate. Therefore, to avoid the confounding effects of the impact of literacy levels on cognitive impairment detection results, the MMSE was completed through interviews and using images, instead of written statements. In the third stage, serum zinc was measured by venous blood samples. At first, blood samples were frozen and stored at -80°C. Then, serum zinc was measured according to the instructions provided in the kit (ZishChem Diagnostics, Iran, detection limit 400 μg/dL, sensitivity 4.0 μg/dL) using a spectrophotometer. Sample and standard compounds were prepared according to the manufacturer’s instructions and after drawing a standard curve; zinc concentrations were calculated and were reported as micrograms per deciliter. Statistical analysis was performed using the SPSS software for windows version 18 (SPSS Inc, Chicago, IL, USA). Descriptive analyses were conducted to compute the percentages, means, and standard deviations for all variables. The Chi-square test was used to identify the relationship between cognitive status and level of serum zinc in the elderly. This paper was retrieved from a doctoral thesis in Medicine. The deputy research of Babol University of Medical Sciences approved and supported the study. The demographic characteristics of the study population are mentioned in Table 1. Of the 1004 participants, 486 (48.4%) were female and 532 (53.6%) were under 70 years old. Figure 1 also shows the flow chart of the participants from the entrance of the study to the analysis. Table 2 shows the levels of serum zinc and MMSE. Of the 1004 participants, 347 (33.3%) had cognitive impairment, 254 participants (25.2%) were classified as having mild cognitive impairment, 82 (8.2%) had moderate impairment, and 11 (1.1%) had severe impairment. The normal range of serum zinc (80 to 120 μg/dL) was found in 160 females (32.9%) and 180 males (34.7%). The high range of serum zinc (> 120 μg/dL) was found in 133 females (27.4%) and 121 males (23.4%), while a low range of serum zinc (< 80 μg/dL) was seen in 193 females (39.7%) and 217 males (41.9%). aRanges: normal: 25 - 30; mild cognitive impairment: 20 - 24; moderate cognitive impairment: 10 - 19; and sever cognitive impairment: ≤ 9. Table 3 shows the relationship between cognitive status and the level of serum zinc. The serum zinc of the population was compared in 2 levels, lower than 80 μg/dL and 30 μg/dL. There was no difference between the 2 groups of elderly populations (normal MMSE and abnormal MMSE) with respect to the level of serum zinc. The results did not support the theory that there is a correlation between serum zinc and cognitive status in the elderly. Also, when the participants were analyzed by gender, a statistically significant difference in the zinc concentration between groups with healthy cognitive function and those with decreased cognitive function was not observed. The lack of an association between the level of serum zinc and cognitive status found in this research is consistent with some previous findings. Rembach et al. (2014) investigated the distribution of zinc in a large cohort study and reported that serum zinc did not show a significant difference between healthy controls and patients with mild cognitively impairment or Alzheimer’s disease (23). Another study found that zinc levels were not significantly different between groups of healthy people, those with mild cognitive impairment, and those with Alzheimer’s disease (24). Ozcankaya reported that no statistically significant difference in serum zinc was found between healthy people and patients with Alzheimer’s (25). Kuyumcu (2013) revealed no significant difference in zinc levels between patients with Alzheimer’s disease and patients with normal cognitive function (26). A meta-analysis reported that there was no significant effect from zinc intake on cognitive function (27). In contrast with our findings, studies have reported that there is a correlation between serum zinc and cognitive status in older populations. Vural et al. (2010) reported that zinc levels were significantly lower in patients with Alzheimer’s compared with controls (28). Markiewicz-Zukowska et al. (2015) reported that zinc concentration correlated to being statistically significantly higher in older people with normal cognitive function and without depressive symptoms than in older people with cognitive impairment and depressive symptoms (29). Baum et al. (2010) reported that serum zinc decreased in Alzheimer’s disease compared to the controls (30). Brewer et al. (2010) reported that blood zinc in patients with Alzheimer’s and Parkinson’s was significantly lower than in the controls (31). It is important to determine why the findings of the current study did not support the association between zinc and cognitive impairment. The reason is attributable to the nature of both the population and information about the zinc mechanism in the brain. First, recent research has forced a rethinking of the role of serum zinc in cognition. To date, the functional role of synaptic zinc in learning and memory is unknown. This information will be essential for further progress in understanding the role of zinc pathways to regulate memory formation in the brain (32). Second, there is not enough evidence to support the beneficial effect of zinc supplementation on cognition in the older population. A large, randomized controlled trial treatment with 80 mg of zinc and copper did not have a significant effect on cognitive performance in an older population (19). Also, studies have reported that zinc therapy has no effect on cognitive impairment in elderly adults (16-18). Third, the data from this study came from a cohort study. Lastly, the nature of the population differed from other cross-sectional case-controlled studies (33). This study, due to the nature of correlational studies, had some specific potential confounders and limitations. In this study, some of the potential confounders could be controlled while others were not controlled. For example, in this study, the impact of illiteracy on the diagnosis results was controlled by changing the way the interview was conducted. However, the measurement of zinc was done in the serum. It is recommended for further studies to be conducted using nails, as nails are more accurate for measurement and they show changes within the past 3 months. Another limitation of the study was being a correlational and not causal study. Therefore, future studies are needed with a longitudinal cohort design to answer the question of elderly people with a zinc deficiency having a higher likelihood of increased impairment in regards to cognition. Also, the data of cognitive impairment was collected by the MMSE. There is no certainty about the truth of the cognitive status of the population. Future research might include a complete view on cognitive impairment of the elderly, and this might be obtained by using alternative methods, such as clinical diagnosis by a physician. Another confounding factor was that approximately 612 people (37%), who were eligible for inclusion in the study, were excluded because of incomplete information. Thus, it is not possible to determine whether this sample is representative of the population. In future studies, the staff need to have more training in data gathering to prevent this lack of accuracy of information. cognitive impairment in the elderly population. The authors thank the social determinants of health research centre (SDHRC) of the University of Babol for providing the data used in this study. Competing Interests: The authors declare that there was no conflict of interest regarding the publication of this paper. Authors’ Contribution: Farzan Kheirkhah and Mahbobeh Faramarzi were involved in the concept, design, editing, and review of the study. Kosar Poorkarim was involved in the concept, literature search, and manuscript preparation. Seyed Reza Hosseini was involved in the concept, design, and review of the manuscript. Ali Bijani was involved in the data analysis. Angela Hamidia was involved in the editing and review. Hadi Parsian performed the biochemistry assays.